That appears to be the theme of this stellar start to the season. It's also in keeping with various hints being thrown around by Gary Glasberg, as when he chatted recently with TV Fanatic's Jim Halterman in this interview. 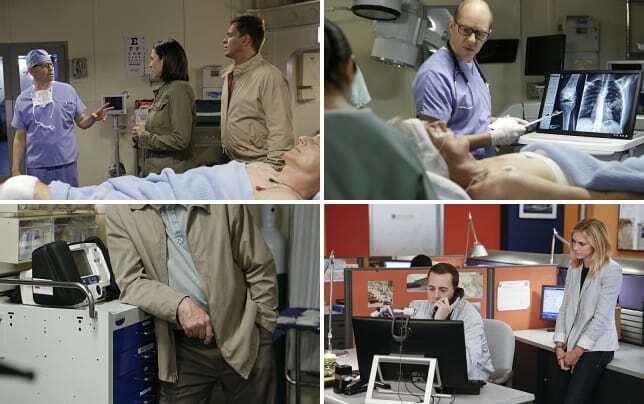 Although we knew ahead of time that Jon Cryer was going to debut as Dr. Cyril Taft – the surgeon charged with saving Gibbs' life on the operating table in NCIS Season 13 Episode 1 – the nature of his character came as a welcome surprise. We're so used to seeing Cryer as the neurotic chiropractor on Two and A Half Men, it was a relief to see him now as an utterly competent and even relaxed and brilliant surgeon. His penchant for "half Mozart, half Motown" music – starting with the song "My Girl" – was equally brilliant as it brought an air of calm to the operating room. If real life patients can hear such music during their operations, it no doubt would reduce their stress level, as well. Interesting that the writers chose to create Taft as a man subject to depression as a result of him losing his son to leukemia. This puts him on a par with Gibbs as one of the few people who can understand the kind of loss he's experienced. This story elevated Tony to the lead guy in hunting down Budd and his "The Calling" gang. Although we know Gibbs was confined to desk duty, there's a strong hint that this may be more of a permanent deal. Tony's confused query to Gibbs at the end "do we need to talk?" confirms it. It still isn't quite clear what Gibbs is thinking or how he's processing all of this. He's disgruntled at his desk confinement and is in constant physical pain. He might be experiencing psychological pain. When he said "I hurt," it seems likely that he wasn't just referring to his physical injuries. He was so glad to see his little girl again, even in his hallucination. So the unanswered question from Taft (about whether he was grateful to be back or otherwise) was telling. The two vigilante-type scenes were startling. I'm not sure I disagree with either of them. Gibbs is certainly experiencing some rage. And whether that came from him being confined to his desk or from his constant pain or his frustration with Budd or a combination of all three, it resulted in him stabbing Rousseau in the hand with his pen. Rousseau probably thought he was free to be as taunting and smarmy as he liked because Gibbs was a military professional, bound by law. Not this time. Vance: Apparently your walk included a visit with Matthew Rousseau. Would you mind telling me why? Vance: With your pen stuck in his hand? Gibbs: Is that where I left it? Permalink: Is that where I left it? The other scene wasn't technically an example of vigilante justice, but it sure came close. The way Budd's death went down can surely be blamed entirely on Tony, given the way he wired his words to make it look as though he was going to execute him. Yet he didn't actually do so until Budd pulled his gun. So technically Tony was in the clear. We can overlook the fact he first shot Budd in the knee. That was a present direct from Gibbs. The whole you're not a Bond villain dialogue was fun to watch, too. It's always great when Tony takes the air out of unworthy egos, isn't it? This is a Tony we can get behind. A guy of decisiveness and action; the agent we've always known him to be. The coming installments will show for sure whether this is a more permanent setting for him, unlike other seasons. Which brings us back full circle to Gibbs. That last scene with him and Taft conveyed many unspoken ideas and hints of things to come. His comment things are changing; can't do it alone suggests he might finally be opening up to sharing his life with someone. Taft's confusion in the follow-up question I've met your team; who says you're alone puts the exclamation point on it. Gibbs wasn't talking about his team. So now Luke is in juvenile detention and destined to go to a halfway house. How does the little assassin have remorse and tears for shooting Gibbs? The old "fool me once, shame on you" maxim applies here. The only obvious benefit to his prodigal return was so that the team could get the location of Daniel's meeting. Still, it was weak. It would have made more sense for him to either escape Tony or jump from the roof. Though the show has used many flashbacks and ghosts over the past seasons (Mike Franks being the most constant), the appearance of Kelly – and the subsequent look of overwhelming joy from Gibbs – qualifies as the most touching to date. I'm not sure Tony has stopped blaming himself for Gibbs getting shot. He blurted rule 45 boss, got it just before disconnecting from Gibbs when he was in Shanghai. That can only refer to the mess he thinks he made by not being closer to Gibbs before he was shot. The one irritating note was watching Palmer maintain his status as group doofus. The smartphone reminder for him to take his digestive enzyme and his awkward praise of Ducky promotes embarrassment to the viewer. It's not fun to watch and it needs to stop. We don't know who killed Rousseau. We just know it was a member of The Calling. So this provokes the question: now that Daniel is dead, is the group defunct as well? Chances are high that it isn't. Budd said as much before Tony shot him. Remember: you can revisit this episode when you watch NCIS online. So now we turn it over to you. Did you enjoy the NCIS premiere? Are you excited about the direction the show will be taking? Hit us up in the comments! NCIS Season Premiere Review: Alive... and Well?